Walking around in downtown St. Louis this Independence Day weekend, I saw a couple of kids, about 10-years-old, skipping next to their parents. The entire family was decked out in Cardinals gear, they were all a little sunburned, and they were laden with stadium souvenirs. Most noticeably, however, this brother and sister duo were laughing and acting nuts, enjoying life while wearing balloon hats. 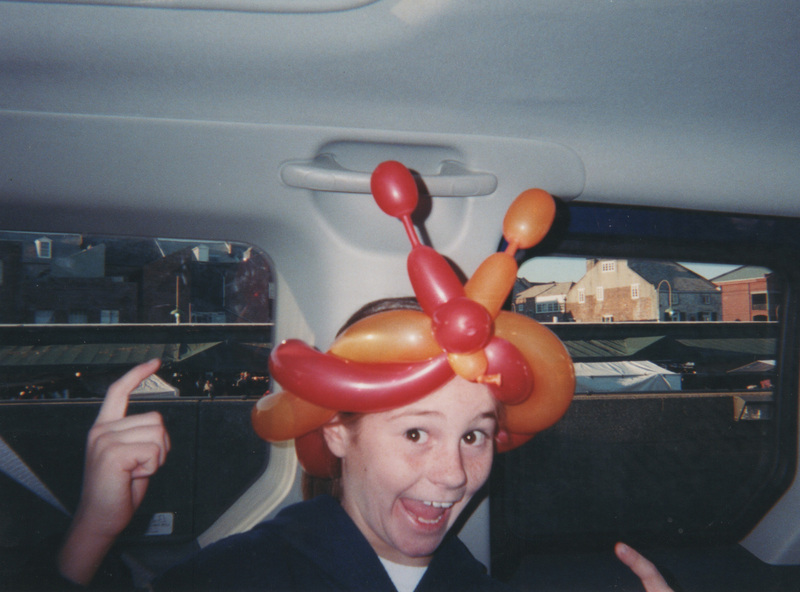 When I saw those silly red, white, and blue balloon hats, Mack’s freckled face popped into my vision and my memory time machine took me straight back to New Orleans, December 2004. Mack was 10. She had just hopped into the back seat of our boxy and blue Honda Element, and just before closing the wide-open suicide doors, I snapped a classic photograph of her. She was laughing and acting nuts. She was over-the-moon, because she had won an important argument with her dad, and she was proudly sporting her championship trophy atop her little head. We had just spent several hours wandering the streets of the French Quarter and Jackson Square, listening to music, eating beignets, and enjoying the performance artists. Mack had been fascinated by a flamboyant man making balloon animals and hats. She set her sights on a hat. Her dad said “no, no, no,” arguing that it was an overpriced and impractical souvenir. “No, no, no, Daddy-O,” she argued. “It is art, and I need it.” Of course, he caved in, like he always did. And Mack chose a red and orange monstrosity with antenna-like balloons sticking straight up in the air. Mack beamed in that hat, just like those two kids beamed in their patriot variety. For Mack, those contorted balloons were the perfect end to a great day. It was simple things like balloon hats that lit up Mack’s world, and I am so glad her dad and I frequently indulged her in her child-like pleasures. It did not take much to make that kid happy, and although that damn balloon hat blocked the rear-view mirror, drove her sister crazy, and deflated long before we made it home to Springfield, Illinois, it was a highlight of the trip for Mack. It also left us with the cherished balloon-hat photo that now so beautifully captures the spirit of my lost girl. When I saw those happy kids proudly sporting their patriotic balloon hats, my heart had smiled for three reasons. I remembered my Mack in her own balloon hat when she was just the same age. I was happy that those two little kids knew how to fully enjoy a simple and silly pleasure. And I was so glad that those parents had purchased ridiculous air-filled hats in spite of the fact that they were likely way overpriced and stood little chance of making it home. I just hope at some point in the day, one of those parents captured a photograph of balloon-hat bliss on the faces of their kids, like I was so lucky to capture on the face of my sweet girl. Maybe those kids had not used the same balloon-hats-are-art argument that Mack had used back in 2004 to claim hers, but those kids (and likely their parents as well), understand the value of a few cheap balloons fashioned into a glorious and artful hat. Balloon hats are art, people. Pure and simple and true. That was so precious. I miss our Macko so much.